The 100 youth and adult allies were joined by Zenobia Thompson, social justice activist from St. Louis, Missouri. She was visiting to share experiences from Ferguson during the African-American History Month celebration that followed. Before the march, participants gathered at the Peoples Center to make a “peace pledge,” writing the name of a loved one lost to violence, or a message of peace, on a red felt cut-out heart. Marchers pinned their red hearts to their coats. Jordan King, an eighth grader at New Haven’s Edgewood School, announced that the youth groups had collected 389 youth jobs petition signatures going door-to-door during the summer months. “The issue of jobs is important to us because jobs will give us better opportunities,” said King. Jennifer Graham, also in the 11th grade, explained that re-opening community centers is central to curbing the violence. “If the Q House (community center) hadn’t shut down, Dixwell would be a peaceful neighborhood,” said Graham. It was the first time some of the youth organized a march. They spoke with confidence and clarity. 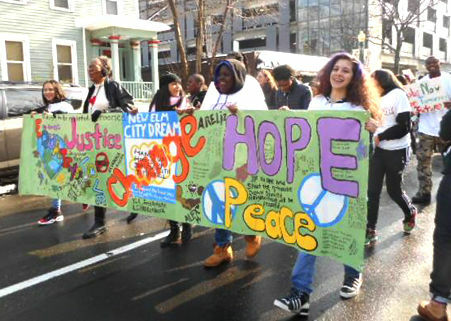 A large colorful banner created in partnership with the New Haven Free Artists featured the words “Equality, Peace, Justice, Hope, Love, Change.” Also marching were the LGBTQ rights group Youth Kickback, the Bereavement Care Network which supports families who have lost loved ones to violence, union members and several elected officials. Guest speaker, Zenobia Thompson, a retired nurse, board member of Missourians for Alternatives to the Death Penalty and member of Jobs with Justice, Coalition of Black Trade Unionists and the Organization for Black Struggle, inspired the audience with her experience in the fight to save Homer G. Phillips Hospital where she worked. This was one of the only hospitals where African Americans could be trained as doctors at the time. When she got a phone call warning her that communists were involved she replied, “Well the communists aren’t trying to close my hospital, are they?” That got her curious. She learned more, joined and is now a member of the National Committee of the Communist Party, USA. St. Louis, Thompson explained, is a historically segregated city. Ferguson itself is currently a seventy percent black population, with fifty police officers, only two of whom are African American. The entrenched racism in the court system in Missouri has distorted not only the outcome of Darren Wilson’s case, but also has vastly increased the number of people facing the death penalty in the state. “We are going to surpass Texas soon with our numbers of people on death row in Missouri,” said Thompson, shaking her head. The murder of Michael Brown and the lies that the right wing promoted afterwards have angered many in Thompson’s community. She explained, “I live just about five or ten minutes from Ferguson. Many people, especially the youth, have been very upset, understandably so.” Michael Brown’s mother, through tears after his death, told the community, “you have no idea what it took for me just to get him to graduate from high school,” said Thompson. Brown was to have begun college the week following his murder. Thompson said that the labor movement had contributed largely to the efforts to address police brutality in Ferguson. One of the unions paid a $15,000 electric bill for a facility where protesters had gathered for shelter and comfort in the weeks following August 9th. The local painters union is setting up a job-training center in Ferguson, where community members can become prepared for jobs that earn up to $35.00 per hour. Thompson closed with an inspiring message to stay in the struggle and stay joyful in the movement. She told the young people in the crowd that she hoped they could learn and carry on the history of pushing for justice. A large surprise birthday cake with the words “Life Matters for All, Happy Birthday Zenobia!” ended the program with a standing ovation and song. The unity of people of all ages that gathered for the march and the celebration gave a sense of hope that such celebrations and the struggle for equality will continue on.